Acceleration 0-­‐100Km/h estimated in less than 3,5 sec. In 1928, during a Grand Prix of Italy, Materassi had a tragic accident, but the team continued its activities with drivers like: Clemente Biondetti and Gastone Billi Peri. During those years, treading the stage of international competitions, he had the opportunity to do a lot of those experiences and establish interpersonal relationships that in the future will be important. One of the most important person who he met was the engineer Alberto Massimino, they collaborate together in the development of the "twin cam head" of the Fiat-Ermini engine and than they designed the chassis and the mechanics of 357 Ermini. 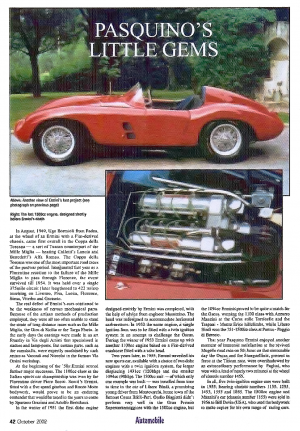 Ermini was able to refine his mechanical concepts thanks to the work realized for the sophisticated 8 cylinders 1500cc super-charge twin cam engine of Talbot cars. 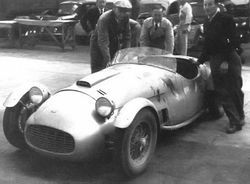 In 1932 with the dissolution of the Materassi' team cars, Ermini decided to open his own mechanical workshop in Campo D'Arrigo street n°7 which become the center for preparation of local gentlemen racing cars. Since 1931 he tried to be a driver with a Talbot obtaining good results. Also in the following years he had opportunities to compete, sometimes driving his customer's car like: the Consuma's Cup in 1935, he drove an Alfa Romeo to the Parma-Poggio Berceto in 1937 (here, he won driving a Maserati 4CM), or as in the three editions of the Mille Miglia (1935, 1936, and 1937). He brilliantly prepared cars for a lot of drivers as in the case of the Contini's Alfa Romeo 6c 1500ss driven along Ermini's foreman Rodolfo Salvadori, beating the competitions of three official Aston Martin reaching 1° place in his class and 9°place overall in the Mille Miglia in 1937. The engine on which the Ermini name was built, a dohc 1100. Pasquino Ermini learnt his trade as a mechanic and driver during the 1920's and 30's with the Squadra Materassi and its Bugatti and Talbot cars. Following the war he built his first car, a combination of a (heavily modified) Fiat 1100 chassis and an Alfa Romeo 2500 engine. With this he competed in various events. 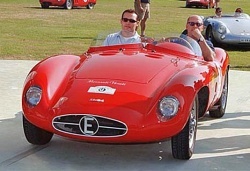 The early 1950's saw the Ermini 1100 as the car (or engine for those who chose to fit it to different chassis') to have. Tofani was unable to meet the demand, and so Motto and Morelli were used to produce the bodies. In 1953 Ermini introduced a new engine. Still a dohc 1100 it now had an aluminium block and five main-bearing crankshaft. Around 20 engines were built and were fitted to cars by Ermini (with a chassis designed by Gilco), Scaglietti, Morelli and Frua (designed by Michelotti). Few existing sports car producers can match the intense, albeit brief, history of the Ermini brand. In the post-­‐war years, the Florentine brand fittingly represented the “prototype” of the Italian sports car – nimble and pacy cars with refined engines, often of low or medium power, with aggressive and intriguing profiles. 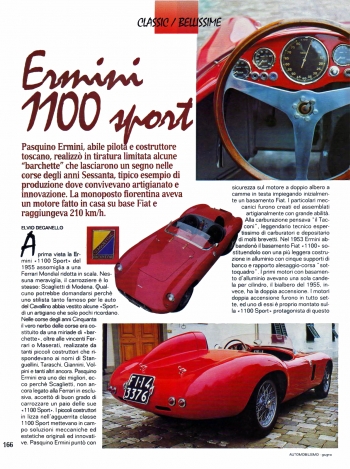 Between 1946 and 1955, Ermini built and powered around 40 automobiles, all sports cars that rivalled, like Osca and Cisitalia, the more high-­‐profile and powerful Ferrari, Maserati, Porsche and Mercedes models, sometimes, quite incredibly, even managing to beat them. On the legendary streets of the Mille Miglia, as well as those of the Targa Florio, the Florentine automaker wrote some of the most glorious and unforgettable chapters in that period of Italian and international motor sports. In just over ten years Ermini or Ermini-­‐powered cars made over 600 appearances in domestic and international races. 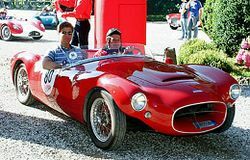 There were many prestigious victories, both in terms of class (such as Targa Florio 1950/1953, Mugello in 1955, the Giro di Sicilia 1952, the Coppa d'oro delle Dolomiti 1949, and the Italian road racing championships of 1950), and outright (such as the Coppa della Toscana in 1949). The specific sporting nature of the Ermini brand is demonstrated by the regular participation of its cars at major international races such as the Mille Miglia, where in 1950, the maximum “Sport” category numbered thirteen Ermini or Ermini-­‐powered cars. The Florence brand also made its mark abroad (even if few Ermini cars and engines left Italy) winning a Dutch class championship in 1953 with an Ermini-­‐powered sports car and competing in several races also in the US. And it was in the US that amateur constructor Bill Devin was inspired by the winding and captivating profile of an Ermini 357 Scaglietti, using the bodywork of the Florentine sports car to develop fiberglass bodies that were later utilised on around 400 sports cars. This fascinating story came to an end in 1962 when the Florentine brand ceased trading. 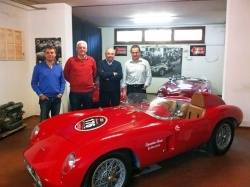 A slumber that lasted until 2007 when, thanks to Ermini Automobili Italia, the company was reborn in Florence, almost fifty years after the closure of the mythical Ermini, one of the most legendary names in Italian sport. “Sport” cars were born on Italian roads, roads of legendary races such as the Mille Miglia (the thousand mile sports car race) and the Targa Florio. 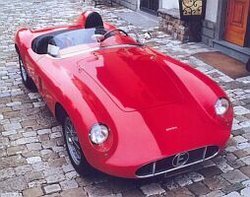 The best car manufacturers at the time (Maserati, Ferrari, Alfa Romeo, Mercedes) used to race side by side with small handcrafted makes such as Osca, Ermini, Stanguellini, Cisitalia, which were often able to be victorious. 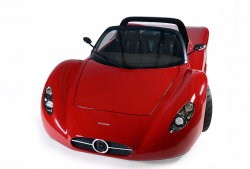 These small car constructors, which were unable to compete with the most renowned teams due to economic/organizational reasons, had to make use of two essential characteristics: agility and lightness. Pasquino Ermini used to say: “I have always thought of my cars as being as light as a feather, able to fly away, arm in arm with the wind.” In order to breathe fresh life into the legendary Italian “Barchettas”, Ermini unveils a world preview of its new prototype, The Seiottosei, at the Geneva Motor Show. The Seiottosei concentrates on the characteristics of lightness and agility of the “Barchettas” of the past, reaching high levels of exasperation. The constructive philosophy of the entire car is a combination between technology, which comes directly from the racing world, and the finest craft making techniques. The refined electric welded space frame, absolutely of racing nature (integrated with the engine and gearbox, with a single integral structure equipped with a precious, and unusual, front carbon nose-box), weighing less than 70 kg!! In order to create it, Ermini has worked very closely with Osella for more than three years, summing up the best racing experiences in over forty years on circuits around the world ... Push--‐road suspensions are treated with PVD (exclusive and complicated aerospace--‐derived molecular bombardment process, certainly not so frequently used on a road car). As a result, the Seiottosei weighs less than seven hundred kilos and thanks to its 320 HP engine its power--‐to--‐weight ratio is just above 2 kg/hp! The desire to create a truly unique and exclusive product has, however, led the designer, Giulio Cappellini, to design the soft and sinuous curves of this original car. A master of design, who has never been in the automobile business, hence not influenced by it, who has designed the Seiottosei starting from the simple concept of “beauty”. To do so, Ermini (thanks to his skilled sheet--‐metal workers) has created the “aesthetic” part of the hand hammered all aluminum body. All this has made it possible to create shapes that are unknown to today's market as they are very difficult to achieve with conventional production processes. The “technical” part of the bodywork (which functions with flows of air to give lift to the car itself and to improve channelling of the cooling air to the engine and brakes) is made of carbon fibre and gives the car a unique and original combination of technology and craftsmanship.